On embarkation day for Un-Cruise Adventure’s first craft beer themed sailing of the season, the majority of the passengers loading onto the ship are baby boomers. But this trip unites wilderness and wildlife lovers with craft beer enthusiasts, so I did spot a few young ones in the crowd. With the explosion of craft beer and its growth in popularity, it wasn’t surprising when the cruise lines jumped ship and got in on the action. While many larger cruise lines offer craft beer on tap, Un-Cruise isn’t your typical cruise line. Their Wilderness Discoverer vessel can only hold 76 passengers at a time. Which means, more brews for you. It wasn’t too long ago that I thought cruising wasn’t about craft beer and personalized experiences, but oversized ships, buffets, casinos and photos with fake backdrops. On my way to the San Juan Islands with Un-Cruise, however, instead of the elaborate shows and gambling guests, I found a library full of books on the area, home cooked meals, like-minded people, and two of Seattle’s best craft beer experts. Un-Cruise Adventures joined forces with craft beer pros from the state of Washington two years ago, creating a seven-night beer vacation around Washington and the San Juan Islands on the 176-foot-long Wilderness Discoverer. Not only do passengers of the Discoverer get the exceptional adventure activities, wildlife sightings, personalized service and incredible dining that Un-Cruise always offers but they also get craft ales onboard as well as brewery visits along the route. Although Un-Cruise does its best to lay out an itinerary for the week, much is dependent on the weather and water conditions, which on a Pacific Northwest itinerary can be difficult to predict. Luckily this company has a way of bringing out the sunshine, and the kayaks and stand up paddleboards are put to good use throughout the week. On one of the days, heading to Protection Island, everyone gets the chance to experience a guided kayak around the shores of this interesting and mysterious island. The isle boasts a whopping 70 percent of the nesting seabird population of Puget Sound and the Strait of Juan de Fuca. It is home to one of the largest nesting colonies of rhinoceros auklets in the world and the largest nesting colony of glaucous-winged gulls in Washington, making it a must visit for any bird lover. Although visitors are banned from going closer than 200 yards to shore, Un-Cruise provides waterproof binoculars, giving kayakers a great glimpse of the island full of winged-wanderers. Another day introduces passengers to Olympic National Park with the ship anchored in the beautiful Hood Canal. With an option of an easy stroll or a slightly longer hike, it is easy to explore the towering trees covered in bright green moss, accompanied by knowledgeable guides who know what plant or flower you are trying to identify. Back on board passengers are treated to homegrown oysters, which are, you guessed it, paired with specialty brews. Add a few more days like those, some breweries tour, and you’ve got the gist of the trip. In addition to the bald eagles, seals, sea lions, fallow deer from Europe, Sitka deer from Asia and Moulin Sheep from Corsica, keep an eye out for killer whales. 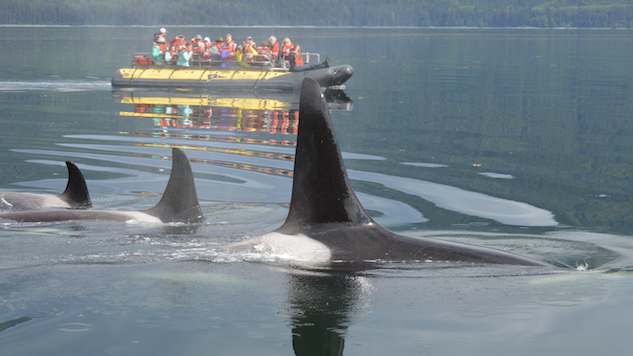 Orca whale watching is a big part of this cruise and although Un-Cruise can’t guarantee a sighting, it wasn’t long before a baby and its parents made themselves known to our boat. One of the main stops along this cruise is into the town of Port Townsend where craft beer lovers get to experience not one but two breweries. The first stop is the Port Townsend Brewing Company, which was established in 1997 and boasts an incredible outdoor tasting garden. Visitors get plenty to sample, including the popular Hop Diggidy IPA, the Peeping Peater Scotch Ale and the traditional Pale Ale, and time with the owner Kim Sands. The second brewery that Un-Cruise takes passengers to is Propolis Brewing, a brewery dedicated to local flavors. Using only local and organic herbs as well as wild-crafted herbs from the forests and fields that owners Robert and Piper pick themselves, the ales created here are refreshing without being overly herby. It is Piper’s artistic touch that draws visitors into this beautiful space while beers such as an Elderflower Saison, a dandelion infused beer and a Flemish Brown Bourbon Barrel Aged Ale keep them coming back. After a tour of the brewery where Robert injects a little bit of beer nerd into everyone, it’s off to the tasting room where Piper charms you with her personality, story and love of creating nontraditional ales. After days of hiking to the top of Mount Constitution, drinking beers I’d never heard of, and viewing animals I never thought I’d get to see up close, nightly talks on the area with the onboard guides and rowdy rounds of trivial pursuit between both passengers and crew offered welcomed relaxation. At the end of every night as the last passengers begin to wind down, there was only one place to find myself and few other guests; soaking our aches away in a hot tub, watching the shooting stars whiz by, craft beer in hand as we attempted to process it all. Lindsay MacNevin is a freelance travel and beer writer who spends her time seeking out one-of-a-kind adventures.